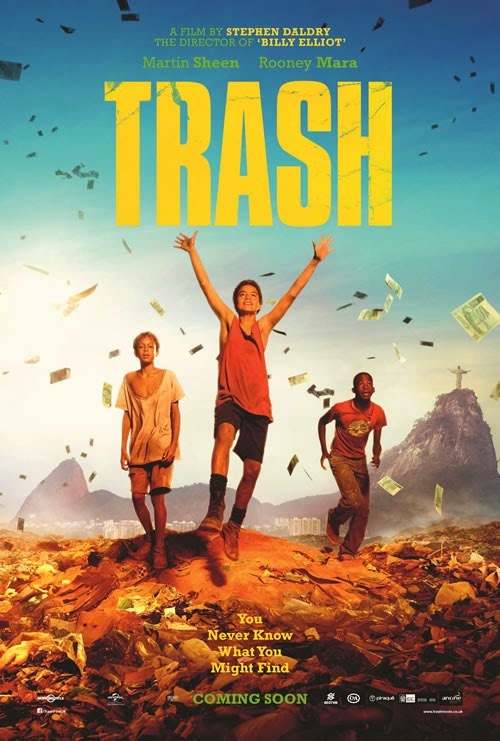 When two trash-picking boys from Rio's slums find a wallet in amongst the daily detritus of their local dump, little do they imagine that their lives are about to change forever. But when the local police show up, offering a handsome reward for the wallet’s return, the boys, Rafael (RICKSON TEVEZ) and Gardo (LUIS EDUARDO), realise that what they’ve found must be important. Teaming up with their friend Rato (GABRIEL WEINSTEIN), the trio begins an extraordinary adventure as they try to hang onto the wallet, evade the police, and uncover the secrets it contains. Along the way, the boys will have to figure out friend from foe, as they piece together the story of the wallet’s owner José angelo (WAGNER MOURA) and realise they can’t trust the police, led by the dangerous Frederico (SELTON MELLO). But a pair of American missionaries working in their favela – the disillusioned Father Julliard (MARTIN SHEEN) and his young assistant Olivia (ROONEY MARA) – might just have the power to knock on the right doors. TRASH is directed by STEPHEN DALDRY and written by RICHARD CURTIS based on the book by ANDY MULLIGAN. A Working Title production in association with O2 Filmes and PeaPie Films, the film is produced by TIM BEVAN, ERIC FELLNER and KRIS THYKIER. From Universal Pictures, TRASH is released in cinemas January 30 2015.